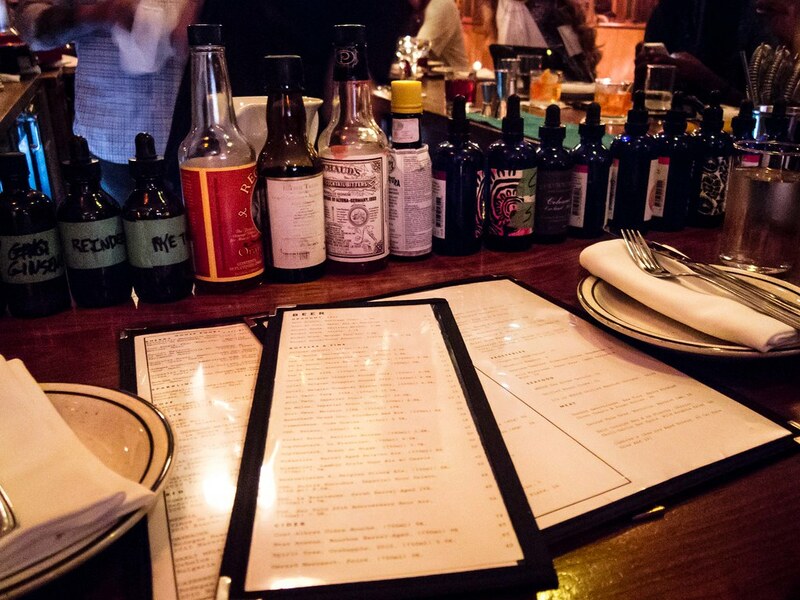 Since opening in 2013, Bar Isabel has been featured in many “top restaurant” lists compiled by newspapers, magazines and blogs. I tried to make reservations in January for a friend’s birthday, two weeks in advance, and the only table available for a party of 3 was their 11:30pm seating. Sadly, we decided to choose a different venue for that dinner. I heard that Bar Isabel only reserves half their tables and leaves the other half open for walk-ins. So I figured the best bet to snag a seat was to show up with a small party, at an off hour and have all our fingers and toes crossed. The Fiance and I visited on a Friday night, at 8:30pm and grabbed seats at the bar with no wait. Amazing. 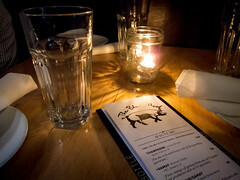 Atmosphere: The space was cozy and the atmosphere relaxed. Lighting was dim, making photos difficult, but creating an intimate and warm feeling. Background music was loud enough for conversations at other tables to blend into the background without drowning out the person next to you. 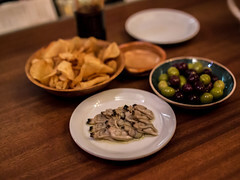 Bar Isabel is the kind of restaurant I would take friends from out of town to. It feels just a bit hipster and can be as fancy or dressed down as you’d like. Service: Sitting at the bar, we were served in part by the busy bartender. I was amazed at how efficient he was. Each cocktail had at least 10 steps (such complicated drinks) and used two or three tools/glassware, yet he had the time to wash everything in between mixing concoctions, clear our plates and make friendly small talk with diners. Each dish arrived with a detailed description and the server made sure there was room on the narrow bar before setting down the plate. Both the Fiance and I were ogling the giant ice cubes being used in drinks. 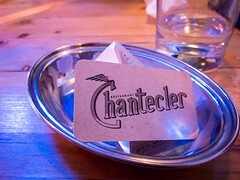 When I asked the bartender about them, he took the time to write down the name and address of where I could find the trays. 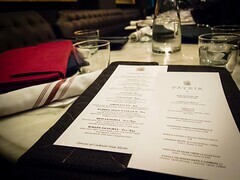 Food: Menu items are encouraged to be shared and designed as such. Pursuing the menu, The Fiance and I decided that our strategy was to try as many dishes as possible. This meant we ordered 4 appetizers, skipped the “meat” section all together and I had to make the difficult choice between ordering the Octopus or Whole Sea Bream Ceviche. While I love octopus, the protein isn’t super exotic for me, so the Sea Bream won out. I do love ceviche. 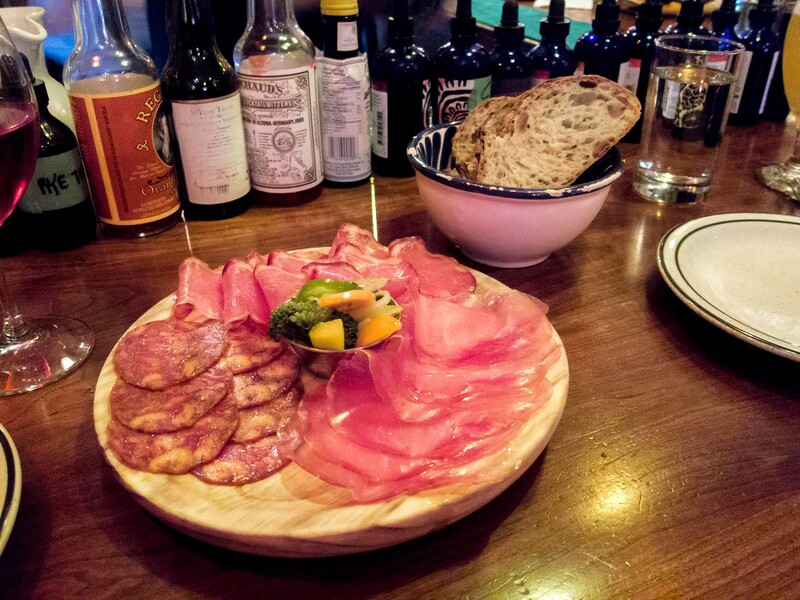 We started with a plate of charcuterie featuring 3 cured meats and house pickles; a solid board with a variety of flavours and saltiness. 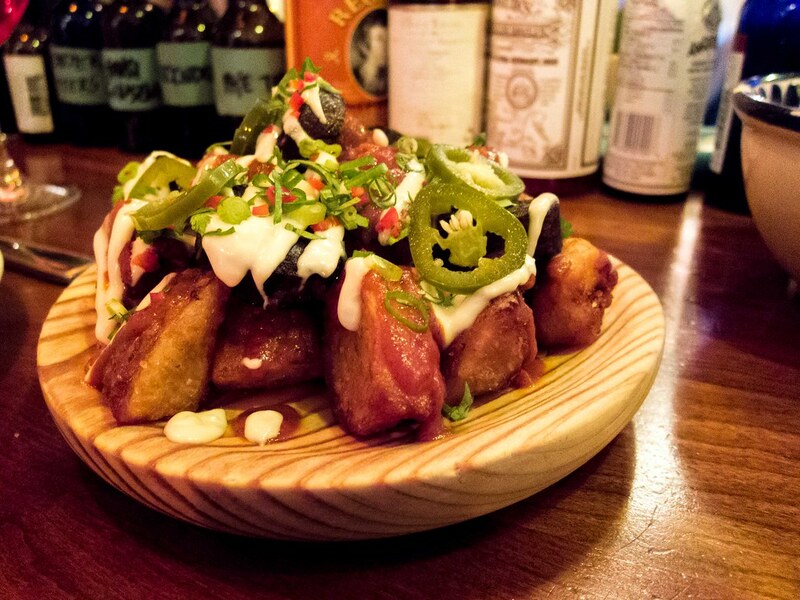 Next up was a plate of Patates Bravas, crispy fried potatoes with blood sausage, covered in a spicy tomato sauce, garlic aioli and topped with pickled jalapeno. The potatoes were crispy, not too oily and the toppings provided lots of spicy, garlicky flavour. 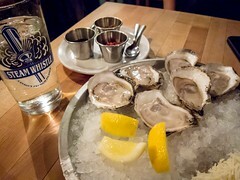 This dish was a great accompaniment to my glass of wine. Our third small plate was Sobrassada with Honey Montadito and Shaved Foie Gras. I loved this dish. 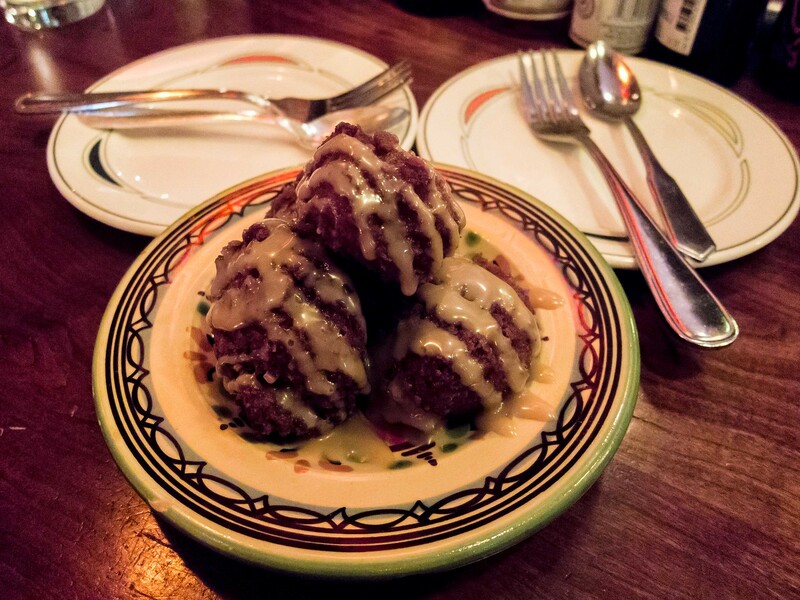 When we ordered it, I wasn’t sure what to expect and what I ate, had my taste buds dancing. 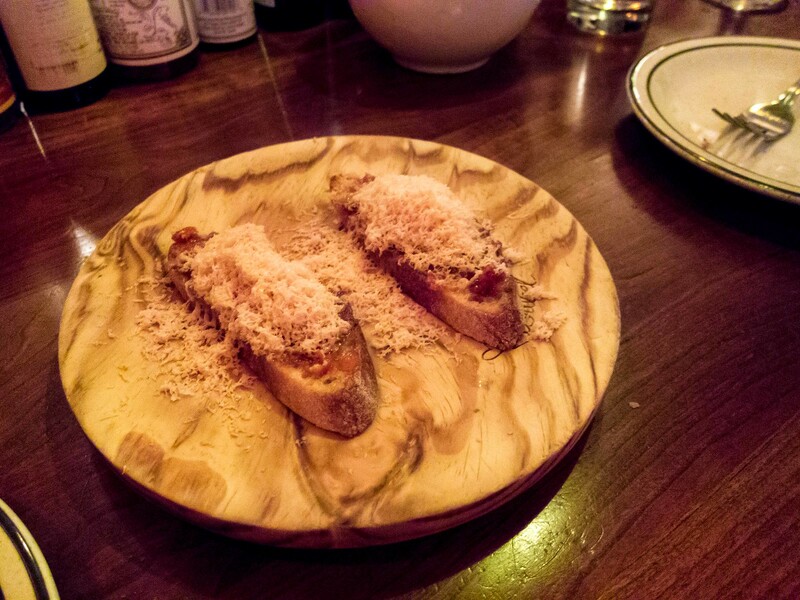 The dish consisted of a toasted slice of bread, spread with sobrassada, honey and topped with foie gras shavings. As soon at the shavings touched my lips, they melted into fatty goodness. I wanted to lick the plate. The sweetness of the honey perfectly complimented the richness of the foie gras. Order this dish. 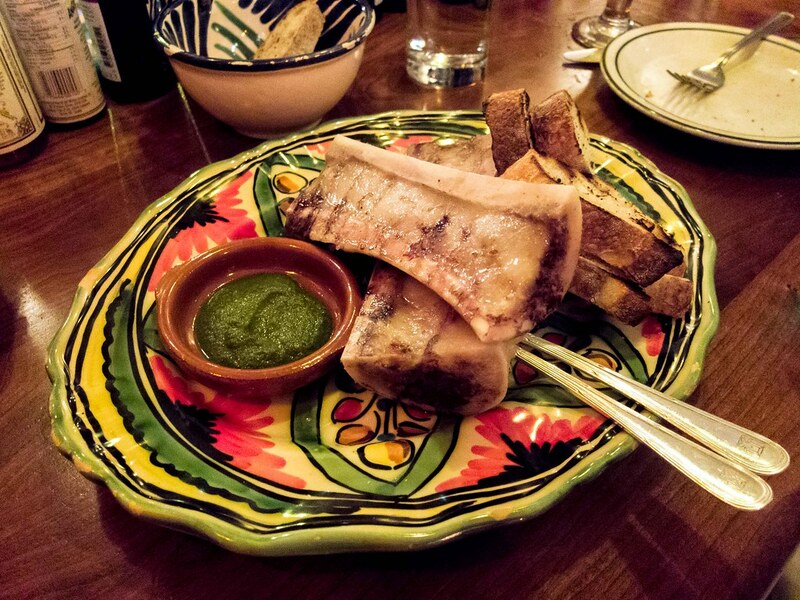 Our last “appetizer” was Roasted Bone Marrow. Two generous, cut, bones were plated with toasted crostini, a plate of chimichurri sauce and a side of sea salt. The bone marrow was rich, indulgent and everything I could ask for, like meat flavoured butter. 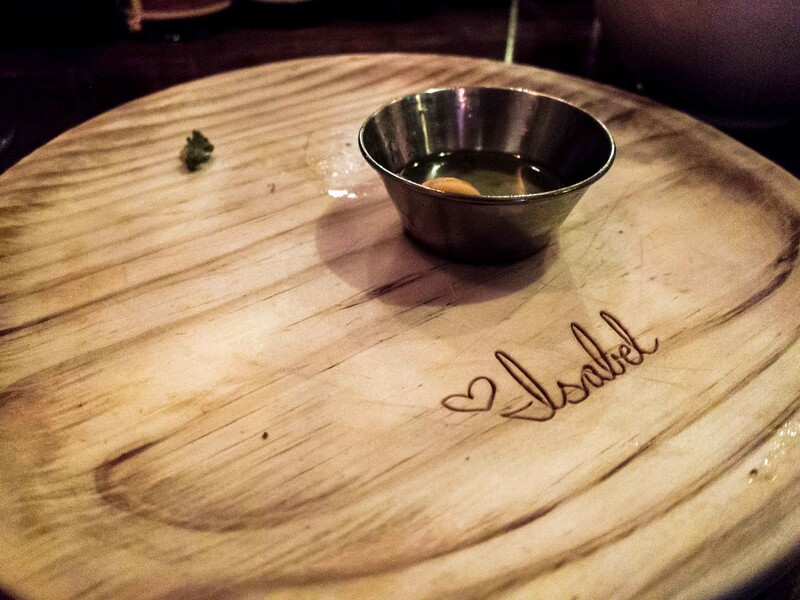 It’s one of my favourite dishes to order and Bar Isabel did not disappoint. Our only real entree dish was the Whole Sea Bream ceviche. 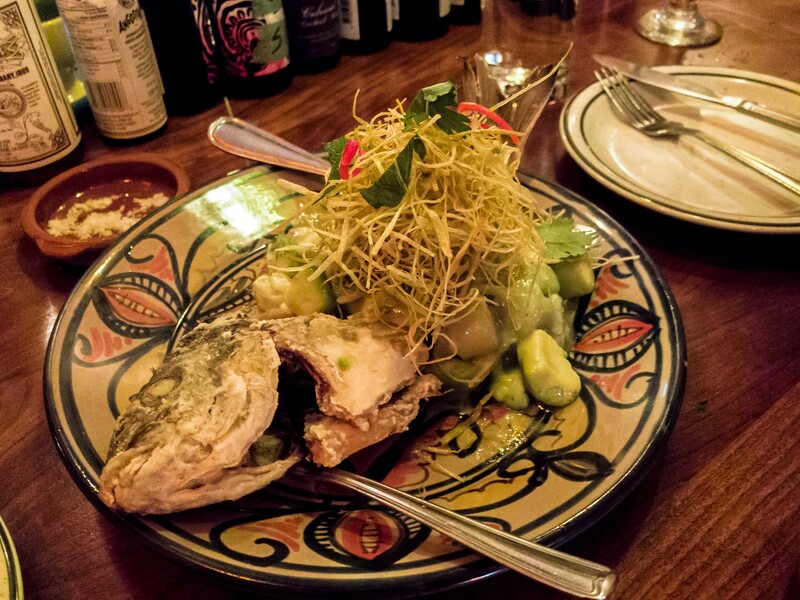 The ceviche itself was in bite size pieces, mixed with avocado, topped with crispy green onion shreds, and served on the deep fried body of the fish. Being Chinese, 90% of the time when I eat fish, it’s whole so I appreciated the presentation and picked at parts of the head (can’t let those cheeks go to waste!). The chunks of avocado added a creaminess to the dish and helped cut the sourness of the ceviche. From all of the delicious plates that night, the sea bream was my second favourite. I was stuffed by this point but we wanted to try dessert and decided to split the Leche Frita and Salted Dulce de Leche. I did not expect the serving to be so generous, four timbit sized orbs of thickened condensed milk. This was the one dish I wasn’t in love with. It was a solid dessert, but a little too rich and heavy for me with a strong milk flavour.